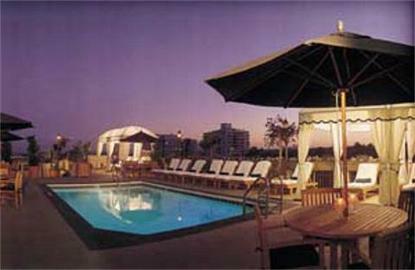 Le Montrose is located in a quiet, residential street just south of the world famous Sunset Strip. The hotel offers 132 charming and comfortable suites, each featuring a sunken living room, a cozy fireplace, refrigerator, color TV with VCR, twice daily maid service, and state-of-the-art multiline phones with data port, voice mail, and in-suite Nintendo/fax/copier/printer. Most suites at Le Montrose include a fully equipped kitchenette, while many offer private balconies. The hotel has also just completed a $3 million renovation.